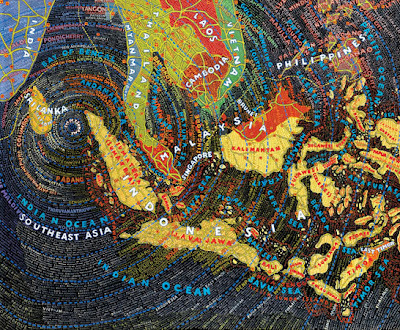 On Saturday I rushed to the Maya Stendhal Gallery to catch a glimpse of Paula Scher's map paintings. I was only there for fifteen minutes or so, not enough time. Luckily the show has been extended for two more weeks!!! I'm super excited. Paula's work is simply inspiring. And I'm not the only one who thinks this, the entire show is sold out. What an incredible feat! I can't wait to see what she does next.